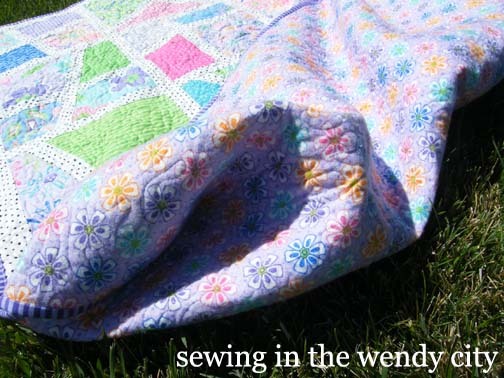 Hi everyone, it’s Wendy from Sewing in the Wendy City, back with my third Moda Bake Shop post! 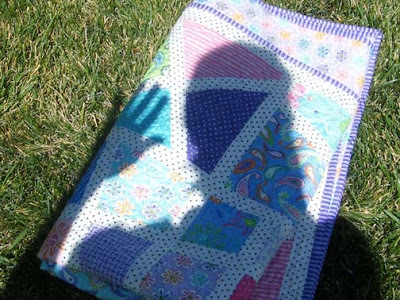 I’m thrilled to bring you a pattern for a child-sized quilt — not quite a lap size, but bigger than a baby quilt and long enough to cover the toes of your grade-schooler. 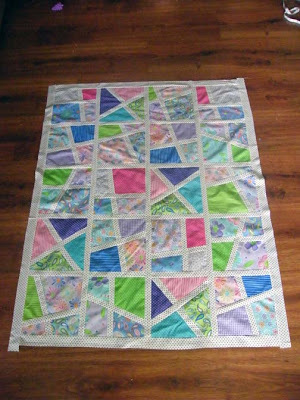 For fabric requirements for a larger sized quilt, please visit my blog. 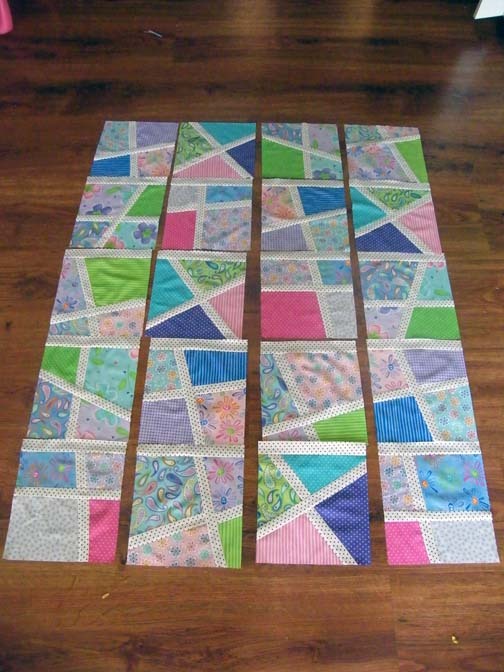 Choose 20 of your layer cake squares to go in the quilt. Since my sashing had a white background, I avoided the layers with a white background. Separate them into 5 piles of 4 squares each. Each of the 4 squares should be a different color or background. Start with your first pile. Stack the 4 squares on top of each other. Take them to your cutting mat and cut a straight line on the diagonal. No need to measure, you can’t do this wrong! Just make sure you are cutting all 4 at one time — very important! 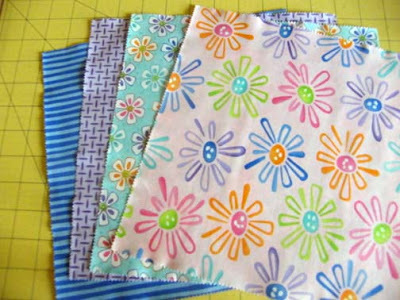 Now you are going to sew a piece of 1.5″ sashing to all 4 of the left pieces (the larger piece). Leave a little extra at the top and the bottom. Press. 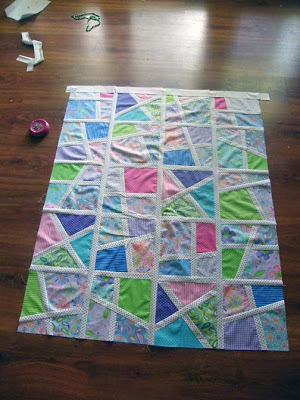 Trim even with the edge of the block. 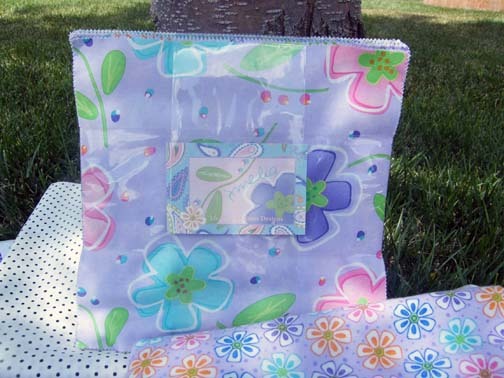 Notice that the purple and teal florals are paired, and the blue and pinks are paired. 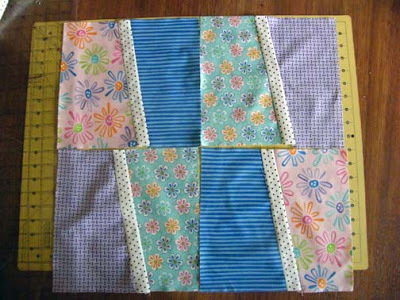 This is on purpose so that it all goes together nicely at the end and each finished block has all 4 prints in it. Stack all 4 blocks and make another cut crossing the first one as shown. Again, be sure you are cutting all 4 blocks at once. Sew a piece of 1.5″ sashing to all 4 of the top pieces. Leave a little extra at the top and the bottom. Press. Trim even with the edge of the block. 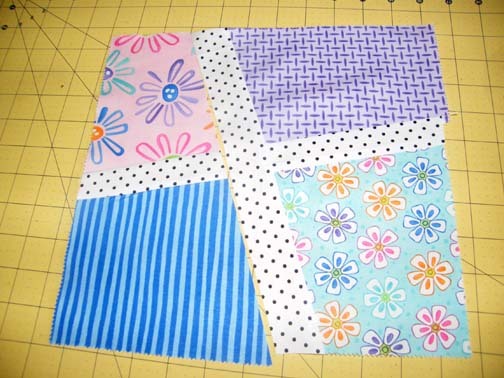 Finally, match up the other side of the block so that each block has all 4 prints in it and sew. You will end up with 4 blocks, each with all 4 prints. Repeat for the 4 other piles of 4 blocks each until you have 20 total blocks. 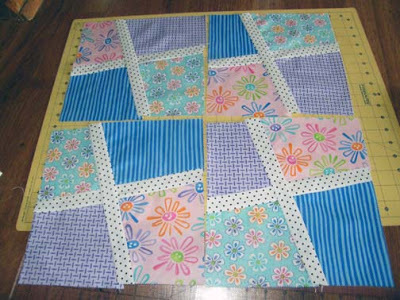 Trim all to 10″ square. Lay them out in a pleasing design. From your 1.5″ sashing strips, subcut into (16) 11″ strips. 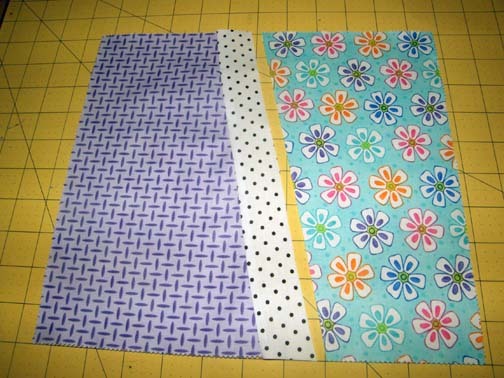 These will be sewn to the bottom edge of 16 of the blocks. 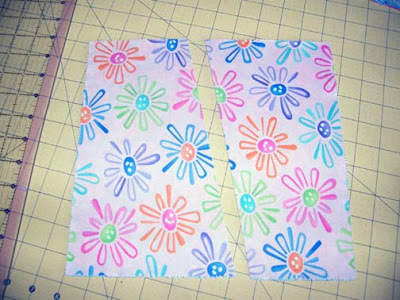 Then sew into columns as shown. 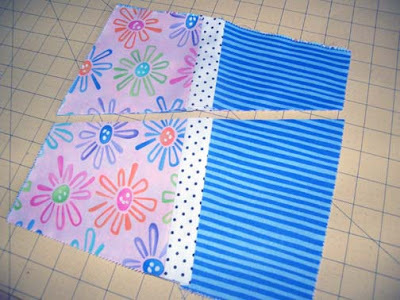 Add in a 1.5″ sashing strip between the columns as shown. Finally, add the 2.5″ strips of sashing to all 4 sides of the quilt top. 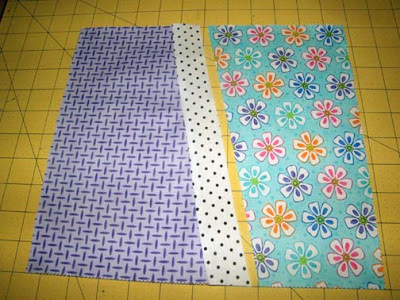 Trim the corners, quilt and bind as desired. I used a flannel print from the Amelia line for the backing, and I love how pretty and soft it turned out! 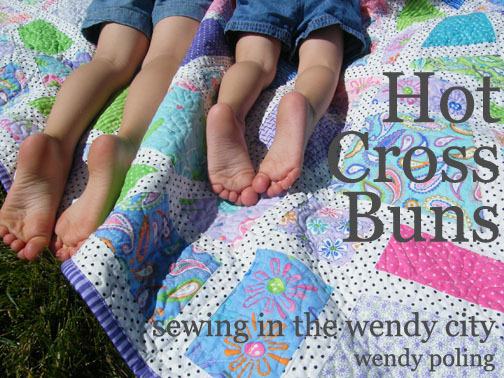 Boy do I love a striped binding! 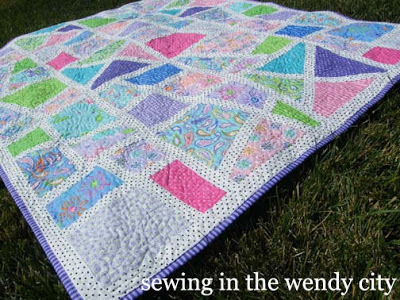 If you wanted to make the same quilt larger, you could make it from 30 squares. To do this, you’d need 2 3/4 yards sashing and 1/2 yard of binding. Finished size would be approximately 65″ x 73″. 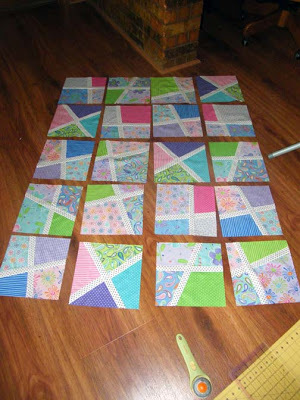 Make 5 columns of 6 blocks each. Want to see what I made with my leftover layer cakes? 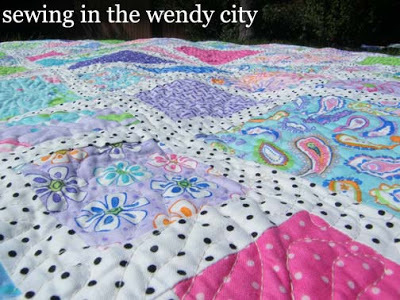 Head on over to Sewing at the Wendy City to see! 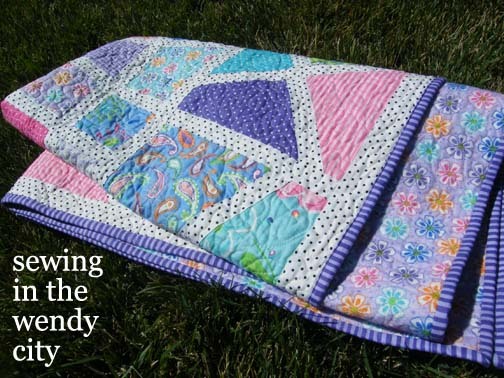 As always, I am honored to post on Moda Bake Shop. Thanks for reading, and have a lovely day! This entry was posted in Easy, Layer Cake, Quilt and tagged Amelia, Me and My Sister.